“The single greatest play I’ve ever seen in basketball…” Tim Capstraw on NEC Hall of Famer Terrance Bailey & The Dunk. The NEC’s 30th Anniversary has given us the opportunity to stroll down memory lane and look back on those who etched their names in the recordbooks and helped build the foundation of the conference. One such player was Wagner’s Terrance Bailey, who will be honored during the Seahawks’ NEC-TV game against St. Francis (NY) on Saturday, February 19th (MSG Network, noon) for being the lone men’s basketball player selected as part of the inaugural NEC Hall of Fame induction class. 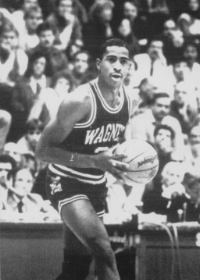 Bailey was a rather prolific scorer in his day, racking up an NEC-record 2,591 career points between 1983 and 1987. Since that time, no one has come within 300 points of matching that total. He led the nation in scoring (29.4 ppg) and was named the NEC Player of the Year as a junior in 1985-86. Bailey won the NEC scoring title again as a senior (28.1 ppg) and finished his career as a three-time first team all-league performer. As you’ll read, it took just two of those near 2,600 points to make Bailey an instant legend to those who were around to witness it. By the way, Bailey dropped 30 in that game against Notre Dame the following season, doubling the output of Rivers, a two-time All-American. Bailey’s legend only grew after his collegiate playing days ended and he taken in the second round by the Atlanta Hawks in the 1987 NBA Draft. Though he never realized his NBA dreams, Bailey did play overseas and has earned recognition in the years following his graduation as part of the NEC’s All-Decade, 20th Anniversary and 25th Anniversary teams. He was inducted into the Wagner Athletic Hall of Fame in 2002 prior to his NEC Hall of Fame honor last December. Capstraw and NEC play-by-play man Dave Popkin here discuss that very dunk, one of 136 in the 6’2″ guard’s collegiate career. Look for Capstraw, who saw Bailey play up-and-close during his time as Wagner head baseball coach in the 80s, to reconnect with the Wagner legend on Saturday when the two chat about the old days at halftime of the NEC-TV game. For those wondering, Bailey is a school teacher in the Trenton area. His son was a recent high school star in the same area where Bailey lit up the scoreboard in the early 1980s.